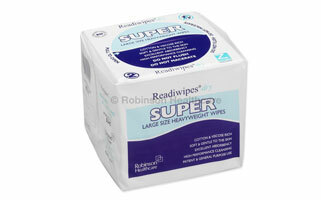 Readiwipes are designed for both carers and users and contain only pure fibres. They do not contain any harmful chemicals or additives that could damage the skin. Packed in a waterproof dispenser bag and z folded to ensure single wipe dispensing. These are semi-disposable cloths and can be used as flannels, They are soft and absorbent and are a good strength whether used wet or dry.